Part 5 of our gripping story of Vicky Rylance’s childhood experiences in Malta during WWII. At the height of the air raids, our family spent most of the nights in the safety of the shelters. This was with the exception of my parents, who stayed at home because my baby sister was always poorly and they did not want her to disturb other people. They used to say that the silence in the street was eerie till they heard the sound of the Air Raid siren, followed closely by the drone of approaching air planes, which was followed immediately by the sound of bombs falling and exploding and the earth shaking. A thing which always filled me with awe as a five and six year old, was when emerging from the blacked out house carried in someone’s arms on hearing the Siren, to find the whole night sky lit up by flares. These flares were thrown by enemy aircraft in order to illuminate their targets. The sight of these flares hanging in the dark sky always terrified me. Another strange sight was the long fingers of searchlight criss-crossing the sky to find enemy airplanes, and when they found them, the arcing of tracer bullets chasing the airplanes. The peculiar drone of approaching aircraft always filled me with fear. I can remember this dreadful noise even as I write. Sometimes even now, sitting in my veranda enjoying the cool of the evening, the noise of an approaching heavy aircraft brings the bad memories rushing back. Thankfully most of the time, we were asleep, safely deep down in our shelter. At night, the children would be tucked up and asleep in their bunks in the shelter while the adults sat about and chatted or prayed the Rosary. One night, I was still awake when they were talking about the fact that somewhere, so many people were dying that they were being buried together in large holes in the ground without coffins. I lay there listening and started wondering if this could happen to me, when I may be still alive though unconscious and would thus suffocate. I got so worked up that suddenly I had a panic attack and sat up screaming in horror. I was immediately surrounded and comforted by my relatives but even now I still do not like being in small enclosed places, I always feel very uncomfortable. This state of almost continuous air raids lasted into 1942. Food and other commodities were becoming scarce. Ships were not arriving in the Grand Harbour; they were being sunk by the enemy on their passage from Gibraltar or Alexandria, with a great loss of life to Navy and Merchant seamen. Spitfires and Hurricanes had miraculously managed to arrive safely and many battles were fought over the Grand Harbour area between enemy raiders and the RAF fighter pilots who were backed by British and Maltese anti aircraft gunners. Many were killed on both sides. Sometimes the odd ship would make it into the Grand Harbour only to be sunk before the despairing eyes of the hungry defenders. The situation got worse as the months and years passed and people just did without. There was nothing to buy in the shops and the supplies left on the Island had to be strictly rationed. My baby sister continued to be sickly and there was no proper food to give her. My mother made broth for her out of bones she got from the butcher. I remember my father coming in from work at night asking right away: How is the baby, is she still alive? Thankfully, she did survive. All basic items of food, as well as soap, candles, paraffin for cooking, not to mention the most important commodity of all – water were in very short supply. In the rainy months some people were lucky enough to have wells in their houses but his had to be boiled for drinking. Some people resorted to an ancient form of cooking stove known as ‘kenur’ which was hewn out of the Malta stone, similar to a modern BBQ, using wood for heat, to eke out the paraffin ration, but there was nothing left to cook. Everything had to be queued up for, and often after queuing for several hours, when your turn arrived the supply had run out. When my mother managed to obtain some eggs, she would give one to each one of us four children in turn. Adults did without. Eventually my father decided to keep some hens on the flat roof of our house to give us eggs and meat. He also kept some rabbits which supplemented out meat ration. Rabbit meals are actually a national tradition. The authorities organised Victory Kitchens. These were situated in schools, where communal cooking took place with Government issued food supplies. We queued up at these places every day at the appointed hour with our plates and each person was dished up the allotted amount – which was not much – for the price of 6d. I remember the food not being very palatable, but it was that or nothing. After the family collected their rations, we used to take it home and my mother would put it in a large pot and try to make it tasty by adding herbs and spices. Luckily my parents, possibly had anticipated food shortages before the start of the war and had stocked up on various dried and tinned foods as well as tea, coffee and sugar. These proved to be manna from heaven by supplementing our rations and made our daily lives a bit more bearable. Supplies of flour became lower and lower and consequently bread, which was the staple food of the Maltese, became rationed and those rations were forever being cut. Each family was allowed one loaf to last all day, which was impossibility. One could get bread on the black market and people were prepared to walk for miles just to get a small loaf of bread or a few eggs. Hardly any buses ran because of the shortage of petrol. I remember walking regularly from Birkirkara to Naxxar, a distance of about 5 miles, with my aunt just to get a loaf of bread. My mother used to slice our daily loaf as thinly as possible, and we children used to complain that our slices were shaking they were so thin. I remember meeting you in Worthy Down. We kept in touch for some time but have not had any contact with you for years. Now living in Zebbug, Malta and I guess you too have returned to the home country. Would be great to see you again. Get in touch if you would like to ….. and if you even have a clue who is writing this!!! A really interesting story Vicky, well done. I look forward to reading each part. Thank you Vicky for sharing your memories. I’m sending them to my mother-in-law in the Isle of Man. She was here during the war. She told me last week that her cousin was a Pilot on Illustrious, and of course she remembers it arriving in Grand Harbour very well. 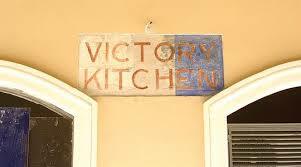 I was always so hungry that the Victory Kitchen food tasted very good ! Thank you so much Vicky. Although I was born just after the war, I love reading anything about what my parents went through during this awful time.